Fall is the time for getting things ready for the next year. I love the feeling of putting the farm to bed, covering the garlic with straw, planting cover crop and peas, and bringing the final harvest in. We are so glad that the rains have finally come, putting out the Camp Fire, and germinating the cover crop. The tiny green shoots are coming up and in the spring, we hope to have a lush cover crop we can mow down and let the earthworms munch on. We have an interesting soil prep method we’ve been playing around with at the Cloverleaf – no-till no-chemical organic farming! We mow the cover crop, spread compost directly on top of it, and then cover with a reusable landscape fabric. We let the ground mulch for at least a month, ideally 2 or 3 months, and then remove the fabric and plant. When we plant our strawberries, we just leave the fabric in place and cut permanent holes in the fabric, and then plant into the holes. The landscape fabric can get used again and again — so far it’s lasted 5 years and it still looks great! We got a Healthy Soils grant from CDFA to look at our no-till soil practices and also to plant two new hedgerows at the farm. We are going to soil sample every year to look at organic matter, soil chemical properties, respiration, compaction and evaluate whether the health of our soils are improving over time. We’re excited to be measuring this and we will share the results here as we learn them! The Cloverleaf is hosting our second U-pick of the season this Saturday (July 16th) from 8 AM to 3 PM. We will have peaches, apricots and nectarines for sale – peaches at $1/lb and apricots/nectarines for $1.50/lb. No U-pick on the blackberries. Please bring your own container if possible, we will have some boxes there but probably we could use more. The weighing station will be in the orchard (north side). We might have one more U-pick, or this might be the last one — it is a great week for some awesome nectarines! See our website (http://thecloverleaffarm.com) for more information on directions and parking. The address is 9055 Olmo Lane – parking will be at the north side of the orchard or our strawberry patch. To get to the north side of the orchard where the peaches are, first take Kidwell exit off of I-80. Then follow the frontage road along the north side of the freeway, until you see a wooden sign that says “Journey’s End.” Take a left and then head right at the fork to the big red barn. Pass the barn and turn left at the T. Head past the fenced strawberry field on the left (or park there at the overflow parking), and then past the netted field and you will see the orchard. The weighing area for your fruit will be in the peach orchard and Katie or Emma will be there to greet you! We are having a U-pick at the Cloverleaf orchard this coming Saturday, June 25th from 8 AM – 3 PM. We have a lot of peaches (Red Haven and June Pride varieties) which will be $1/lb per pound for the U-pick as well as Independence nectarines and Brittany Gold apricots for $1.50/lb. If you can bring your own box, that would be great – if not, we will have some there. We will also be offering that U-pickers can pick an extra box of peaches that will be donated to the Yolo Food Bank. We will deliver all the extra peaches people pick on Monday. The address is 9055 Olmo Lane – parking will be at the north side of the orchard or our strawberry patch. Overflow parking will be on the south side of the barn. To get to the north side of the orchard where the peaches are, first take Kidwell exit off of I-80. Then follow the frontage road along the north side of the freeway, until you see a wooden sign that says “Journey’s End.” Take a left and then head right at the fork to the big red barn. Pass the barn (where the overflow parking is) and turn left at the T. Head past the fenced strawberry field on the left (or park there), and then past the netted field and you will see the orchard. The weighing area for your fruit will be in the peach orchard and Katie will be there to greet you! We decided to try a new CSA funding system this year – CSA by donation! Our prospective CSA members were asked to donate for their CSA box anywhere in the range of $210-420. The idea is that we could have members who might not be able to afford the CSA box otherwise, while members who felt they contribute could help make up the difference. First off, the background – why did we try this? Back in November, I went to a presentation by Ryan Galt on his statewide CSA survey. Two facts stuck with me – first, that the average price of a CSA box was around $25 (while we had been charging $20 for all our fruit box). And second, that the lowest income CSA members reported being the happiest with their CSA boxes statewide. We had been told by other farmers and friends that our CSA boxes were priced much lower than alternatives on the market. We don’t like undervaluing our produce, partly because we are still working on making a living wage at the farm. But also, if we undercut other farmer’s prices, then produce loses value overall, and all farmers will have trouble making a living wage. It seemed like we needed to raise prices. But we also don’t like that many people are unable to afford good quality, local, organic produce. And the people that wouldn’t be able to afford our produce would actually be the happiest with it, had they received it. So we wanted to raise our prices, but we also wanted to recruit more lower income members. Major dilemma. We first thought of doing a sliding scale rate based on income level, but it made us really uncomfortable to ask CSA members to report their income levels (and we thought they wouldn’t want to either!) Then we thought of honor system marketing – supposedly, when a customer feels they are being trusted (ie. in a farmstand with a cash box and no employee on staff, where it is on the honor system to pay for your produce), they will get an endorphin boost and actually contribute more! We talked to some members and other farmers, and some people thought we were crazy, but other people were really, really interested and want us to report back whether this works. So the results! The average price was $300.63 for 14 boxes, or an average price of $21.47 per box. So our members actually contributed more than last year, of their own volition. What is also interesting is that our returning members donated more ($314.66), while the new members, who really have no idea what kind of tasty fruit they are getting into, donated less with $256.57. Also, interesting — we had 4 members at the very upper tier, who really contributed to making the whole system work. The data nerd in me wants to know how the donation amounts correlate to income, but I’m pretty sure there are some outliers — the top 4 donation amounts are returning, super-supportive members, one of whom is a grad student. I’m feeling pretty happy with the new system, and it was really exciting to see how it worked out. We also got a lot of great advice over a homemade dinner from a new CSA member, Ariana Brill, who studied cases like these in economics classes, so we’ll be improving the system in future years. Thank you so much to our CSA members for participating in this experiment!! The peaches and nectarines are pollinated to the brim this year. We’ve been coming up with theories about why the pollination seems to increase each year. The nearby honeybees aren’t doing so well – each year their populations seem to dwindle, perhaps because of the Paraquat that gets sprayed on the conventional walnuts across the way. But maybe the native bees are increasing in population since there is less competition with the honey bees? Xerces says here (http://www.xerces.org/wp-content/uploads/2008/11/farming_for_bees_guidelines_xerces_society.pdf) that many native bees have a much shorter range, which can be as low as 50 ft. My small 4 acre organic, no-till orchard might be the perfect habitat for native bees. We see many more of the tiny, small native bees versus the honeybees at bloom, so maybe they are helping out! However, peaches don’t need to be pollinated by bees to set – self-pollination can occur for the most part in peaches, nectarines and apricots. Our current theory is that our amazing fruit set this year is mainly due to the temperature during bloom this year. While the chilling hours were actually lower than many previous years, we had an amazing amount of flowers on our trees this year, especially the nectarines. I’m not sure why we had more flowers – maybe the rain after the drought stimulated a large bloom? But then the temperatures during bloom were an average 70 deg F, pretty close to the optimum temp for self-pollination of 68 deg F.
Of course, the high pollination rates aren’t all good news. Each mature fruit would be tiny if we didn’t remove most of the fruit at this stage, a process called thinning. The apricots only take ½ an hour to thin, but the peaches and nectarines are going to take about an hour each to thin. I was taking off 90-95% of the fruit of the nectarines I was thinning today. That meant I took off 15 fruits for every fruit I left, leaving a carpet of nectarine pebbles on the ground. I like to think of the fruit trees sighing in relief after I thin their branches, as if I had just removed about 600 bags of produce they were carrying on their arms as they made their way out of the store. We’re racing to make it by the time the pits harden – if we can thin all the fruits by then, we’ll have big beautiful peaches this year. Wish us luck – you’ll know if we made it when you see the size of our fruit this year! 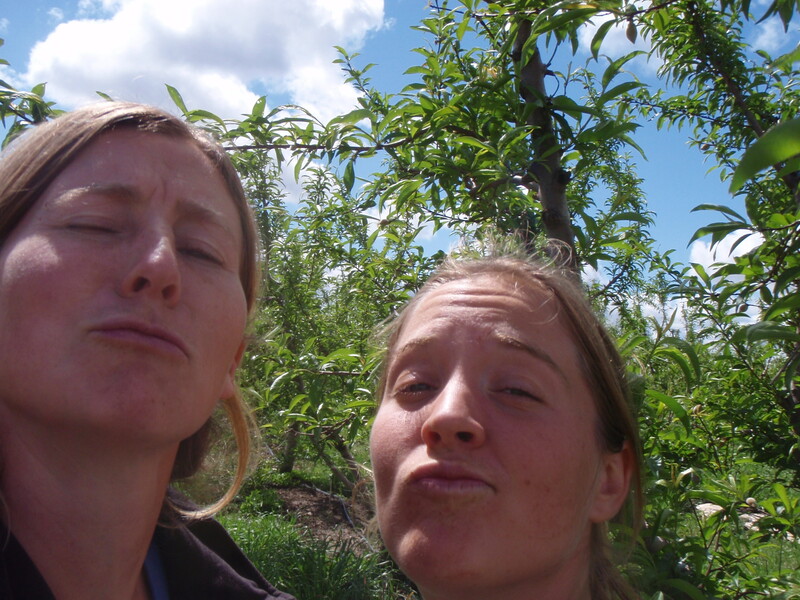 The fruit marathon, beautiful peaches and a farm tour! This week feels like the end of a long marathon — the solar panels are installed on the barn, the first soil moisture sensors are up at the farm and the graywater system is set up where we wash our crates! We are excited about anything we can do to save water and energy, though our water use isn’t what is going to break the groundwater bank. We have our fingers crossed that the well will last to the end of the season — although the groundwater has plunged this year, it actually doesn’t look as bad as last year’s level which in our area got to around 200 ft. The fruit picking marathon is still going strong, and all the fruit has been ripening much earlier than usual. I think it’s due to climate change, personally — the warm spring I think made a lot of the fruit varieties change their ripening patterns and so we don’t have the normal staggering we’ve seen in other years. But it could also be due to our watering schedule — we try to stress the trees just a little bit with under-watering, and that could be making the fruit ripen earlier as well. We have had some beautiful and tasty peaches this year! I just sampled the fruit in San Francisco this weekend in front of the Bi-Rite store. It was very gratifying to hear from so many people how tasty our peaches are! A lot of times we are picking and packing the fruit as fast as we possibly can, so it is nice to hear the feedback of our customers! And also to carefully savor a section of peach as carefully as you would a square of chocolate. Each peach is perfect in it’s own way — look at this awesome peach with a whale and a sunset that you could be so lucky to buy! We also have a farm tour this Saturday with Slow Food Yolo. We’re going to bring out the hand-cranked ice cream maker to make some slow and salt-chilled peach ice cream. And then we will have Shelly’s peach crisp as well and a farm tour where you can try the peaches straight from the tree. See the flyer below for more details. Yum! We are entering a new fruit season at the Cloverleaf! We’re excited and nervous for a new season — we’ve got a big beautiful crop of fruit, but the drought is lurking in the back of our minds as to whether the groundwater will last for the season. We don’t have a big deep well, so we could easily lose pressure half way through the season. But we have our fingers crossed (June rains, anyone?) and are working ahead on a lot of water and energy conservation projects, which at least makes us feel productive. The Cloverleaf, Collins Farm and Hearty Fork farmstand will be opening up this Saturday, May 23rd! We should have the first of the Robada apricots and also amazingly flavorful Zee diamond peaches. Obsidian blackberries, the best for making jam, can be bought by the flat as well. We’ll have pies from both Collins Farm and the Butterfly Vegan Bakery and FatFace popsicles! The stand is open Saturdays and Sundays from 1 – 7 PM — Kidwell exit off of I-80. Ruhstaller also has beer tastings at the same time, as an extra draw. Also, we will have two U-pick events this year, instead of the weekly U-picks, on July 5th and August 2nd from 8 AM – 3 PM. Mark your calendars! Also, for any Cloverleaf volunteers and CSA members, we’ll be having more frequent U-pick events, so email us to sign up (see picture above for how idyllic our volunteer days are, wine tastings and all). We planted melons this year in a small patch — they seem to be doing great & we are excited to include them in our CSA. This coming 2 weeks we are trying a no-till cover-crop mulched planting (idea from Mike Madison) and we’re excited to see how those turn out. We are working on a number of water projects (a new solar panel for our pump, soil moisture sensors in a collaboration with Mark Chang, a graywater system for the vegetable washing water) and I feel like an ostrich with my head buried in too much to do (also getting to check out the soil moisture at the same time 🙂 We also have a new farming partner — Mousse the puppy! He has been busy helping us thin the lower hanging fruit on the trees. Aerial seed bombing and wildflower community event – Saturday Sept. 13th! A FREE community event celebrating the Bee Friendlier Movement. Educating the community on the importance of planting wild flowers and its direct impact on the farming community. Come see us drop over 50,000 brightly colored seed balls from a vintage WWII crop duster to plant a wildflower field at the Cloverleaf, Collins Farm and Hearty Fork farmstand! Meant to be an inspiring spectacle for children and adults alike. Educational workshops and speakers. Live Music from F St Stompers featuring Panmixia. Honey Tasting by Moonshine Trading Co! Wild Flower Seedle Making Demonstration! At 5PM don’t miss the Filming of Aerial Stunt for Bee Friendlier Documentary! This is a kid friendly event and kids are invited to make a wildflower seedle to take home. Please Note: Documentary film crew may be on site filming. I just ducked in to escape an April Fool’s hailstorm and downpour. The build up to the thunderstorm was amazing from the top of the apricot trees. The orchard looks beautiful and lush out there with all the rain. I know I should be hating the rain coming down on all the baby peaches, and keep checking them for any signs of disease, but after the drought this winter, the abundant green fills my heart up with gratitude. We’ll all be a little late planting this year, but that’s OK, right? Much better than the brown, dry soil crust we had before. I’m also feeling so grateful for all the help in the orchard this year. Katie Fyhrie is my new farm partner and she is great! She comes to the Cloverleaf after starting a small vegetable farm last year and is currently in the California Farm Academy. Katie’s also trying to start a juice business (Juice Mama!) for the farmstand this year and is currently hard at work deciphering all the regulations. I could go on about how complicated this state makes starting a small business. 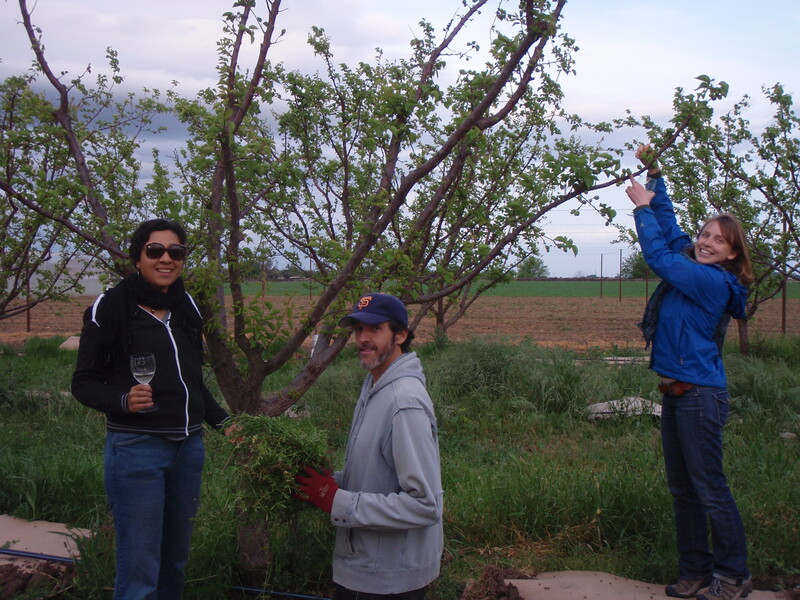 We’ve been weeding, thinning, working on signs & owl boxes, and … planting vegetables in the orchard! We are both very excited about this – we’ve planted beets, carrots, strawberries, spinach, arugula (in very small quantities) and wild leeks (or ramps). We’re going to be planting all these crops on the berms to increase our water use efficiency. Rather than watering weeds on the berms, we’ll be watering our crops! We’re also going to try a strip down the side with perennial herbs and one strip down the middle with peanuts and sweet potatoes. Oh yeah, and about 300 basil plants in the nectarines because they are supposed to help with thrips. Maybe we’ve been getting a bit too excited – we can’t lose sight of our big thinning task and the fruit! I estimate we’ve got about 5 weeks left until harvest begins… We had a wine and weeding party and some classy looking ladies helped supervise Tree weeding on his knees in the cleavers. And good news – we just got our official organic certification this morning! It’s been a long transition period. I’m hoping that this will help the net sales this year and hopefully I will finally break the minimum wage barrier in my fourth season! The cover crop that we planted with our EQIP grant is another thing that makes me so grateful and excited lately. The BIOS cover crop was a mix developed with almond farmers and researchers at SAREP – it has over 20 different kinds of seeds. The tidy tips, mustard and red clover are just blooming, we’ve been harvesting cilantro and dill for about a month now, there’s carrots, wild celery, rye, alfalfa, lupine, calendula and the vetch is just starting to climb out of the mix. The idea is that the cover crop will go to seed and I’ll be able to mow it just before our first U-pick. I’ve had a great year at the farm — so many tasty fruits my stomach is going to burst at the collective impact of all the peaches I’ve eaten this year. The farm has been supported by so many: the Davis Food Coop, Soil Born Farms, Heavy Dirt Farm, Bi-Rite market in San Francisco, Everything Under the Sun (who is soon going to bring us our stashes of dried fruit), Pop Nation, June Taylor’s Still Room, and all the loyal customers in Davis including our fruit CSA customers. Thank you so much! I have about a week left of picking apricots and then a couple weeks more of figs, and then I’ll be waiting for the fruit to begin again next year. I’ll be having some weeding and wine parties soon to whip the orchard back into pristine shape — the weeds have been winning in the weeding vs. fruit picking battle. And then the pruning, then the thinning and then it begins again! for jams, salsas, and more!